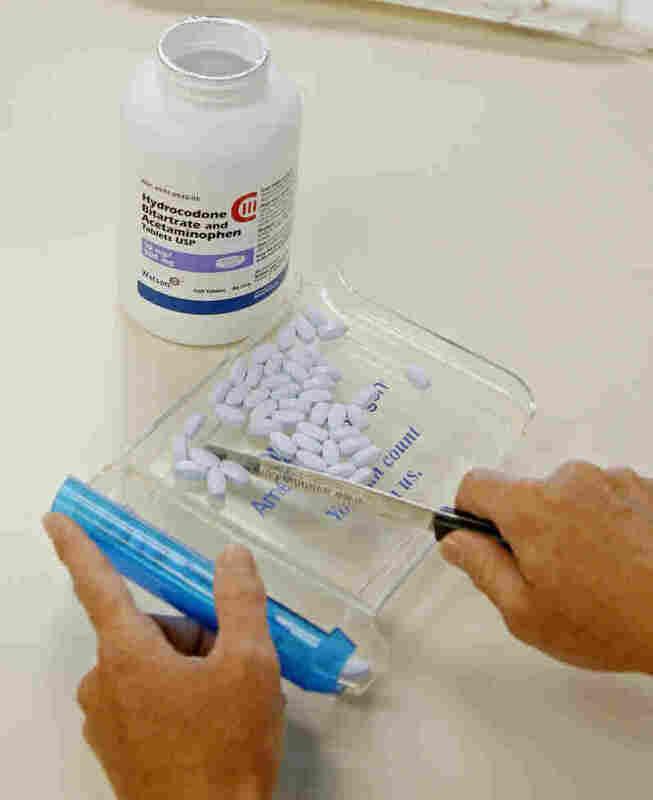 Across America, The Grip of Prescription Painkillers Tightens : Shots - Health News An analysis from The Associated Press, based on data from the Drug Enforcement Agency, shows how sales of oxycodone and hydrocodone have ballooned over a decade. Tens of millions of Americans turn to powerful painkillers to ease their sufferings. But an analysis on the sales of two prescription drugs over a decade is particularly worrisome. Check out The Associated Press' interactive map at the end of this post. It uses data from the Drug Enforcement Agency to show how sales of oxycodone and hydrocodone ballooned from 2000-10. You can click on individual states to see which areas had the biggest increases. An accompanying report says U.S. pharmacies in 2010 dispensed the equivalent of 69 tons of pure oxycodone — the key ingredient in OxyContin, Percocet and Percodan — and 42 tons of pure hydrocodone — the key ingredient in Vicodin, Norco and Lortab. That's enough to give every person in the U.S. 40 5-mg Percocets and 24 5-mg Vicodins, according to the AP. Oxycodone sales jumped more than 500 percent in New York, Florida and Tennessee. NPR's Greg Allen has written on the prescription drug abuse epidemic in Florida. He says addicts and traffickers in other states regularly make trips there on Interstate 75, which some people now call the "oxy express." The Centers for Disease Control and Prevention says 74 percent of the 20,044 deaths from prescription drug overdoses in 2008 involved opioid painkillers. As Scott Hensley pointed out in Shots last fall, some doctors "have called for a re-think of narcotics to treat chronic pain, citing a lack of evidence for that practice and serious problems with misuse." In an NPR-Thomson Reuters Health Poll late last year, half of the 3,000 respondents said they had been prescribed a narcotic painkiller at least once. More than three-quarters said the drugs are linked to addiction, while more than one-third reported having used narcotic painkillers despite having concerns about their use.